Teenagers today are normally very “wired in”—never seen without iPhones or other personal devices—spending endless hours gaming, and streaming and sharing video and music content. What would happen if these young people were to be isolated on a sailing boat out at sea, totally separated from their electronic devices, for days or even weeks? 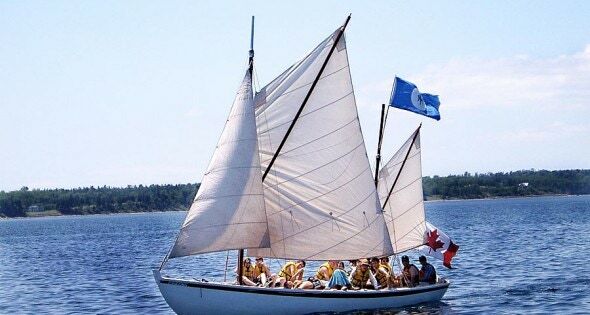 Welcome to the Nova Scotia Sea School, a nonprofit organization that provides small-boat ocean adventures for teenagers from all walks of life, from all over the world. Most of the teenagers that come to the Sea School have never been in a boat before. In this case, they’re usually quite surprised at the lack of amenities. To reflect the real world, Stookey’s program ensures there is a true cross-section of society on every trip. “Of those who enroll, 20 percent come with community services funding, 40 percent get some kind of financial support, and the rest pay full fare,” he said. “So there will be the valedictorian and the captain of the hockey team, then kids living on the streets and everybody in between.” This microcosm of typical society allows students to apply what they learn on the boat to real life. The co-ed mix of students comes locally from Nova Scotia, but also from as far away as the US and even Europe. If these kids expect to learn much before they depart, they’re mistaken. “We don’t do any real onshore training,” said Stookey. “We let the boat be the teacher right from the start. The first thing that they have to do is learn how to row, because there’s no engine, just oars and sails. At the wharf we teach them how to row; then we row the boat out to a mooring in the harbor. There we spend time teaching them how to get the sails up and down. Then we sail away.” A trip can last anywhere from five to twenty-one days—all out at sea, occasionally visiting uninhabited islands. Stookey has two powerful stories he likes to tell to illustrate the impact the school can have on students. “I had one student, a boy, who had just turned fourteen,” he recalled. “He was really good at everything—just one of those super-competent kids, a very quick learner and also very modest. He would learn things and then he would show other people; he was an ideal teacher. “But he was just unbearably homesick the whole time. He would be crying because he was so homesick. The rest of the teenage crew didn’t want to see another teenage boy crying—it was really an embarrassment; so they spent a lot of time trying to fix this situation for him, make him not be homesick and be super good friends with him. “But after a while they discovered that actually they didn’t need to do that. He was setting an extraordinary example of being willing to be homesick and still at the same time capable of learning everything, teaching other people, and helping everyone take care of each other. The rest of the crew started to give up all their complaints; because if this kid could do what he was doing and still be homesick, then what did it matter to them if they were a little bit cold, or if their hands were tired from rowing, or if they didn’t like the food? It provided a different perspective on things. That became one of the highest-performing trips that I was ever on, from that one boy’s example of a very vulnerable kind of leadership. “And then there’s another guy who also started when he was fourteen. He had been in foster care for a number of years and things were really difficult back home—but he discovered that he really loved boats. He came back year after year, every year until he was seventeen. Almost all the current staff at the Sea School originally came as students—a testament to the program and the lure of sailing. Stookey’s founding of the Nova Scotia Sea School came from two different passions outside his career as an architect. “I grew up loving small wooden boats,” he said. “I went to sail on Cape Cod in the summers, where we had an old-fashioned wooden catboat. Then in my thirties I began to discover through volunteer work that I also really enjoyed working with teenagers. “In 1988 I took a break from my architectural practice—my personal life had kind of fallen apart at that point—and in the course of that time off I discovered that there were traditional sailing ships still around and that you could actually get paid to work on them. It seemed like a dream come true. I got a job on one of those and for a while didn’t go back to architecture. For more information on the Nova Scotia Sea School, please visit www.seaschool.org.